Text analytics is applicable wherever big/fast text is found. True, not every analytical application directly involves text. But in a world powered by big data, every task may be enriched by the inclusion of text-sourced information. 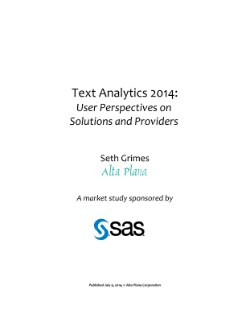 This report looks at why and how text analytics has found success in industries such as consumer-facing businesses, public administration and government, life sciences and scientific research. It also shares the findings of a comprehensive market study focused on user experiences with the technology. Finally, you’ll see how SAS can help organizations evaluate text like the human mind would (minus the inconsistencies) and achieve better discovery and analysis.